Fly away the urban ! 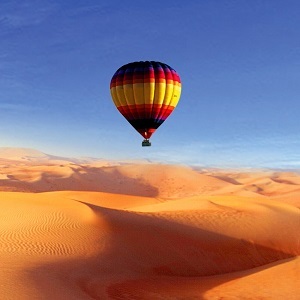 meet your guide and be ready to experience the wild part of Dubai away of urban and modernity, Take the balloon up and discover the green colored oasis which bright among the yellow sprawling desert with unique creatures as camels, gazelles and desert animals. Back once again to the hugs of our pure nature and take all nowadays life activities off. After landing, you will be welcomed by your driver and transfer back to hotel. Tour is just come on private booking basis and needs a down payment before booking. - We do not recommend the tour for your child under 8 years.